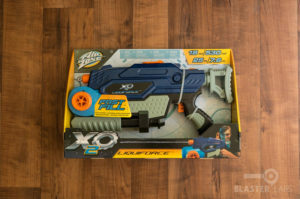 On a recent trip through the aisles of our local Toys “R” Us, we spotted a line of water blasters under the Toy “R” Us-exclusive “Air Zone” (now “Sizzlin’ Cool”) brand, called “X2O.” This interesting looking series included no less than four blasters of varying sizes: the Hydromatic, Liquiforce, Aqualizer, and Drenchinator. They ranged in price from $9.99 to $24.99, respectively, and are now on-sale for a couple bucks less (depending on model). 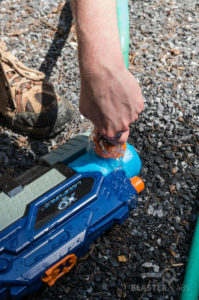 We wondered if a value-priced water blaster could possibly compete with the big name brands, so we picked-up the mid-priced Liquiforce and put it to the test! 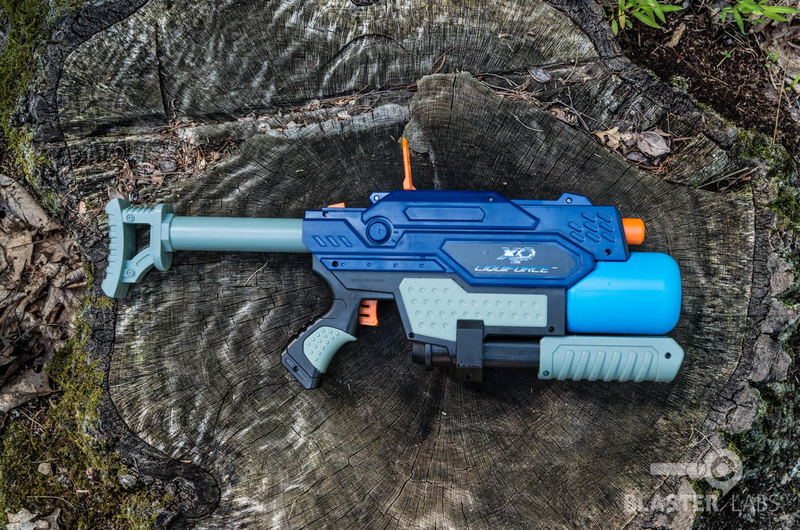 On the shelf, the X2O Liquiforce looks cool enough: there’s a “Spectra Sight” flip-up reticle, an adjustable “Steady Control Stock” that aids in stability, an ingenious-looking “Fast Fill” cap system, and of course the “Action Blast” front-mount pump. The box gives a 25 foot range, and an 18 oz. water capacity. None of these are mind-blowing by themselves, but wrap it up in some nice-looking box art and add in a tougher-looking industrial design for the blaster itself, and you’ve got a pretty compelling package–especially at the current sale price of $11.24. Once we had the Liquiforce out in the wild, it’s more humble roots as a value-priced model began to become apparent in its ergonomics and design. 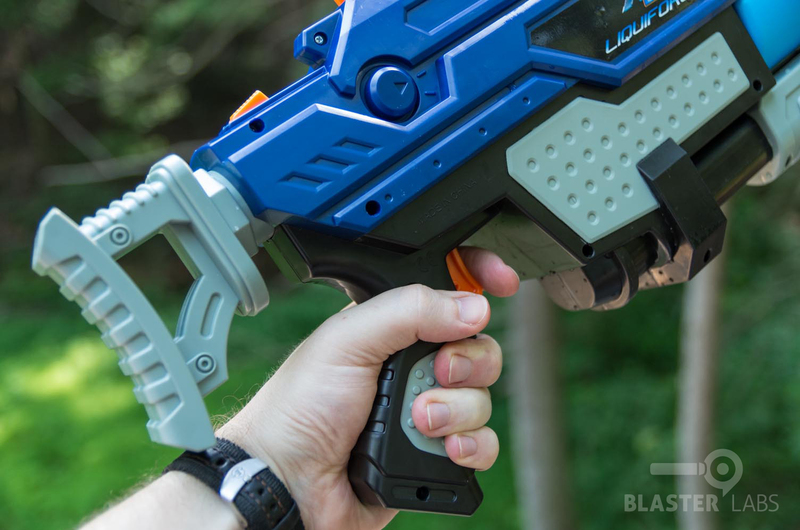 Though the mid-sized model in the X2O line-up, the Liquiforce is actually on the large side of things compared to many water blasters it competes against, and though the handles and trigger are comfortable, we could see smaller children having a hard time holding the blaster properly. 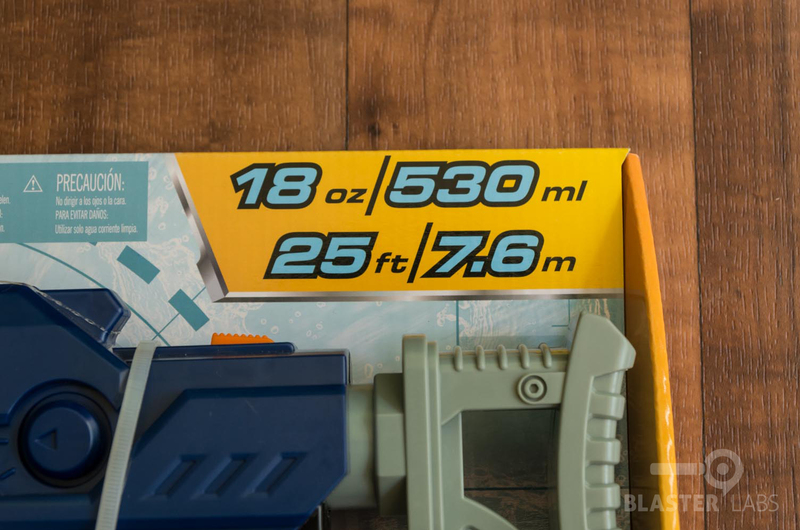 This last point is especially true given the fact that for some reason, the manufacturer decided to mount the water reservoir as far forward in the blaster as possible (using none of the blaster body itself for water holding, even though it looks and feels as though the bulk of the blaster chassis is hollow). 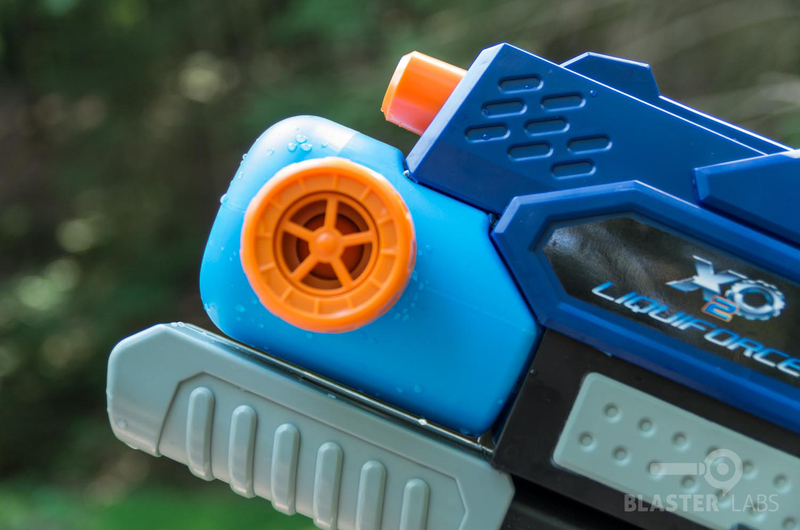 The Liquiforce is, therefore, very heavy in the front, and incredibly unbalanced–this is in contrast to how most other water blasters are designed, such as the Buzz Bee Outlaw, which spreads the weight of the water across the body of the blaster. We also found the short draw of the priming handle to be less than optimal, since successive, rapid pumps feel far more tiring than long, slower ones. Design-wise, however, we like the Liquiforce reasonably well. 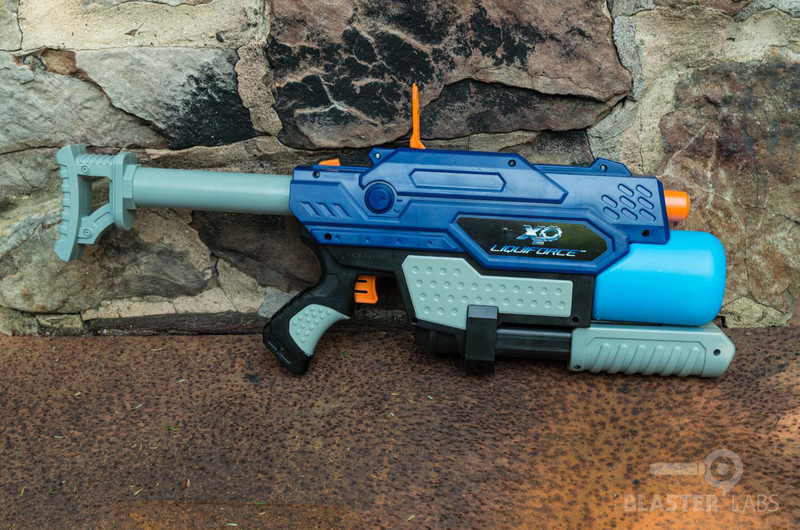 Unlike the bulbous, cartoony lines of some water blasters, the X2O series is considerably more mil-sim looking, with tactical elements like the collapsible (but non-removable) shoulder stock and flip-up target sight, and darker color tones that look aggressive. It’s a little chunkier in places than we would like, but the clean lines are definitely on the right track. 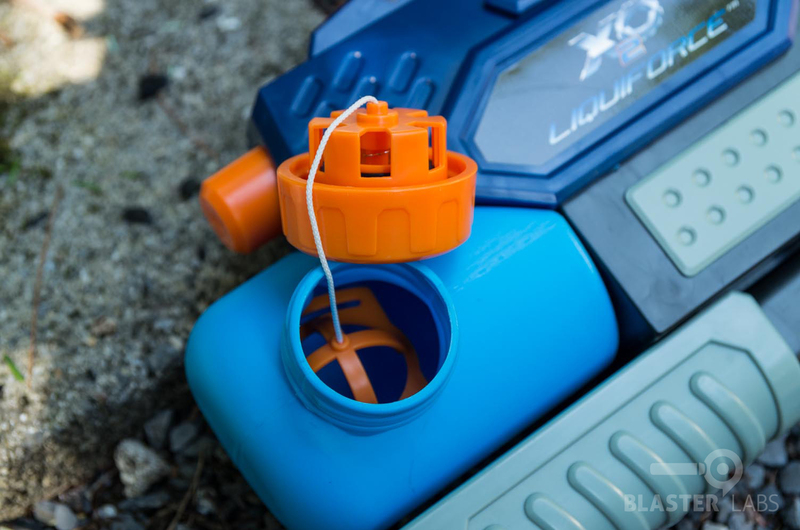 In the field, we found the air-powered Liquiforce to be a mixed bag. We were surprised to discover that with an average of 15-20 pumps, we were able to exceed the manufacturer’s claimed range of 25 feet by almost 30%, hitting a relatively amazing 34 feet with a fair amount of inclination. We actually hit 36 feet in one attempt, but only with a few drops. Regardless, the 25 foot distance claim is easily obtainable, and more importantly, very repeatable. 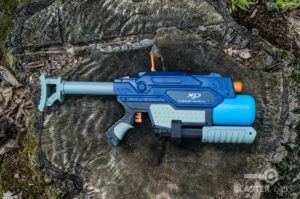 Although the Liquiforce requires a good amount of pumping to achieve maximum performance (again, 15-20 pumps is about right), those pumps are good for several shots in succession. 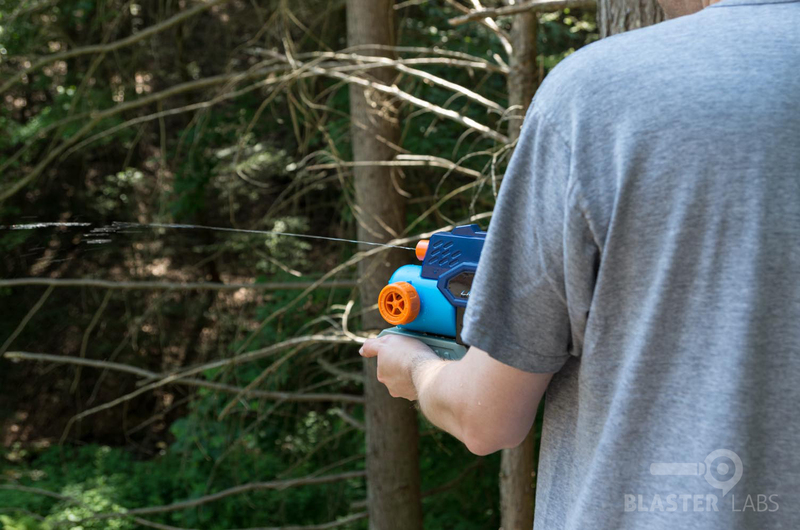 Using just 15 pumps, we were able to shoot a continuous stream of water for over 40 seconds, or several shorter bursts in a row, all with negligible drop-off in distances. If there was one significant downside to the performance of the Liquiforce, it would have to be the thin water stream produced. While having a thin stream does prolong the life of the meager 18 ounce water tank before a refill is required, it doesn’t do any favors when it came to stream lamination or accuracy. 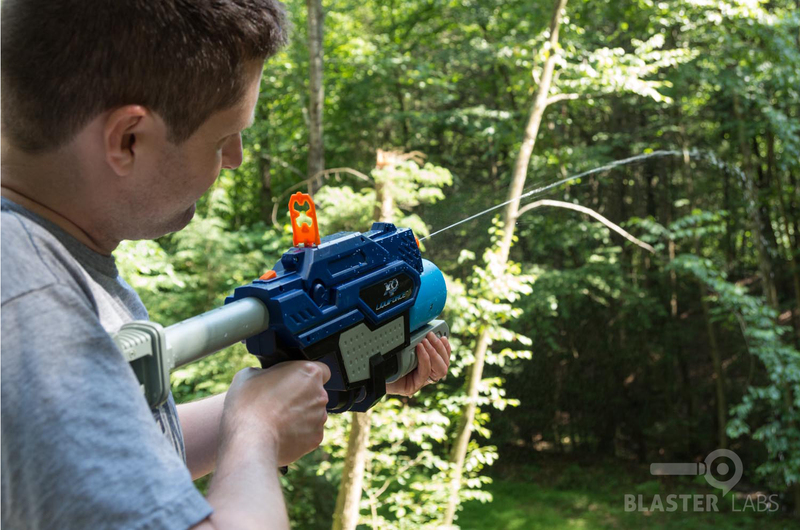 Many of the Buzz Bee Water Warriors blasters produce streams closer to 1/8″ in thickness, but the Liquiforce appeared to be closer to 1/16″ in diameter, which made its streams more susceptible to wind and general break-up. 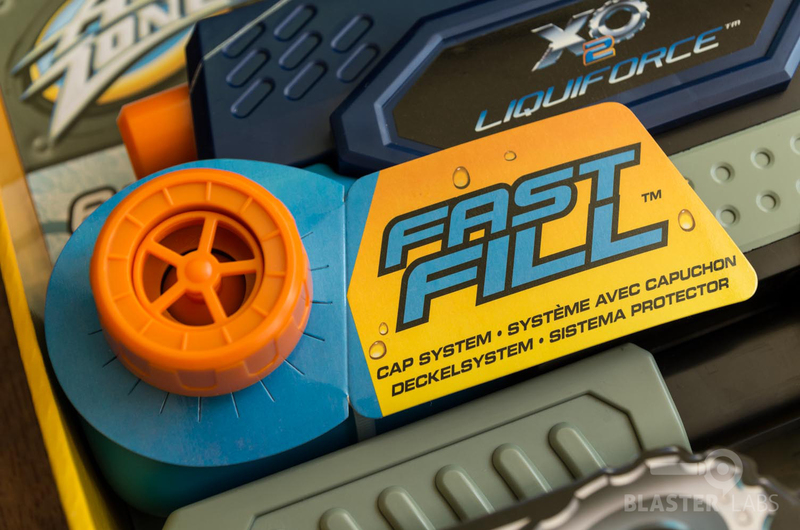 When it came time to refill the aforementioned water reservoir, the bold Liquiforce packaging (and prominent placement of the refill cap on the body of the blaster itself) implies that its “Fast Fill” cap will do the job more quickly than the traditional means of unscrewing or popping a plastic cap. In theory, all one has to do is press a garden hose into the spring-mounted cap, and once filled, allow the cap to spring back and re-seal. It’s a novel idea, and it kind of works, but it tends to make a mess in the process. 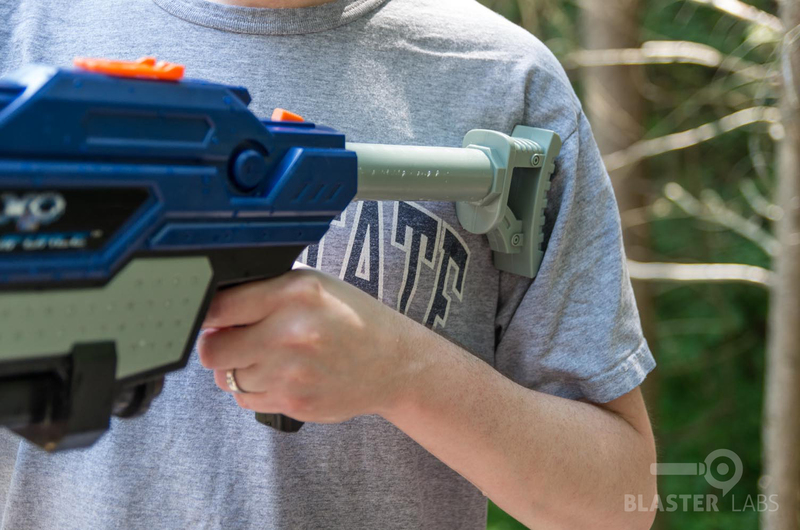 Fortunately, it seals well enough that water and air leakage aren’t an issue, and the cap can be unscrewed like a normal water blaster as well, if that is your preference. 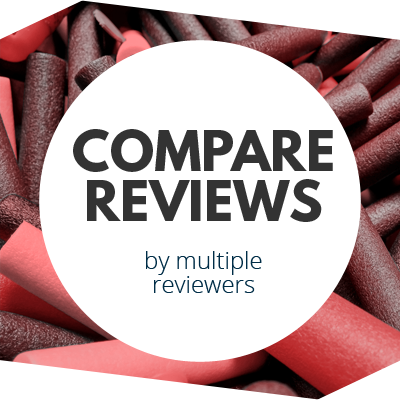 It’s hard to fault a product that performs better than advertised, and does so while being cheaper than most of its competitors… but we will, anyway. Chief among our complaints is overall build quality–the Liquiforce just feels like it’s made of sub-par plastics, and that tolerances are perhaps 10ths of an inch versus 100ths of an inch. 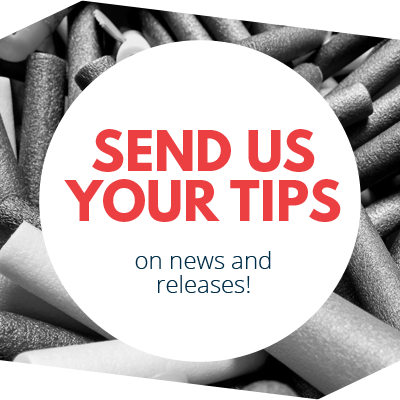 Certain parts like the pop-up sight will literally pop-off with the flick of a finger. While other parts, like the collapsible shoulder stock and short-action priming handle, just didn’t feel pleasant to use. In addition, we experienced moderate water leakage from around the priming handle (though commendably, not around the novel “Fast Fill” cap). And let’s not forget the unforgiving, front-heavy ergonomics, or the very thin water stream that tends to disperse faster than competitors. 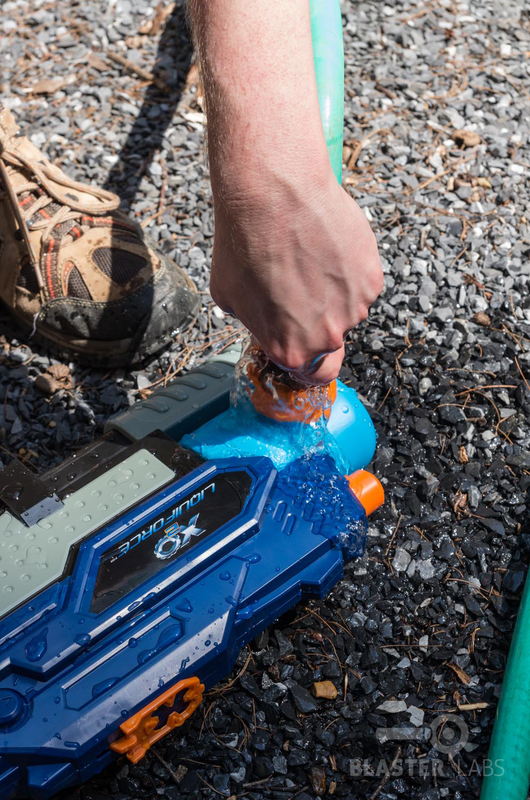 All told, the Liquiforce isn’t a bad water blaster… far from it, actually. In fact, it’s somewhat surprising that for less than $15, it performed as well as it did. But overall, it just wasn’t that much fun to use. We hit good distances, and the streams did last a while, but the impact of the shots were minimal, and accuracy was too easily impacted by environmental conditions. 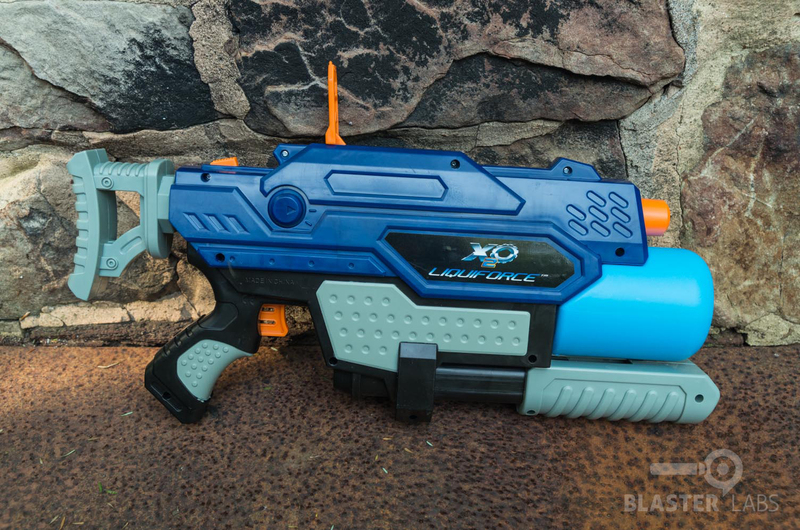 In short, when put side-by-side with “real” water blasters (from Buzz Bee, or even many Super Soaker models), the Liquiforce would quickly be outclassed and outperformed. So while the Liquiforce isn’t the worst performer, and aesthetically it’s better than most, its low price doesn’t necessarily make it a great value. 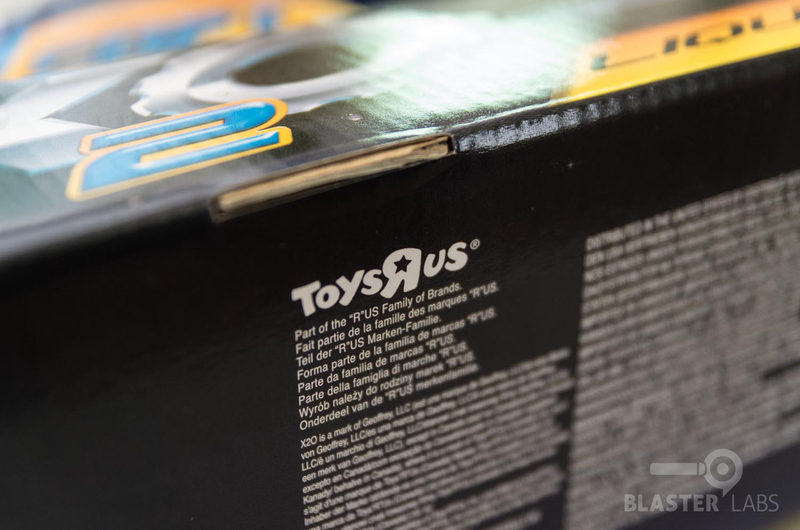 This entry was posted in Reviews, Water Blasters and tagged Liquiforce, review, Sizzlin' Cool, Toys R' Us, water blaster, X2O on July 6, 2014 by PMindemann.